The Piccadilly line (/ˌpɪkəˈdɪli/) is a London Underground line that runs between Cockfosters in suburban north London and Acton Town in the west, where it divides into two branches: one of these runs to Heathrow Airport and the other to Uxbridge in northwest London, with some services terminating at Rayners Lane. Coloured dark blue (officially "Corporate Blue", Pantone 072) on the Tube map, it is the fourth-busiest line on the Underground network with over 210 million passenger journeys in 2011/12. It is partly a deep-level line, with a number of surface sections, mostly in its westernmost parts. It is named after Piccadilly, the street under which it runs between Hyde Park Corner and Piccadilly Circus. Some of its stations are shared with the District line (between South Kensington and Ealing Common) and some are shared with the Metropolitan line (from Rayners Lane to Uxbridge). It is the second-longest line on the system (after the Central line) and runs to the system's second-largest number of stations (after the District line). The Piccadilly line serves many of London's key tourist attractions, including the British Museum (Russell Square), the numerous museums around South Kensington, Harrods (Knightsbridge), Hyde Park and Buckingham Palace (within walking distance of Green Park station), Leicester Square (with its own station) and Covent Garden (also with its own station). For detailed histories of the Great Northern, Piccadilly & Brompton Railway (GNP&BR), the Great Northern & Strand Railway (GN&SR), and the Brompton & Piccadilly Circus Railway (B&PCR), see Great Northern, Piccadilly and Brompton Railway. The Piccadilly line began as the Great Northern, Piccadilly & Brompton Railway (GNP&BR), one of several railways controlled by the Underground Electric Railways Company of London (UERL), whose chief director was Charles Tyson Yerkes, although he died before any of his schemes came to fruition. The GNP&BR was formed from the merger of two earlier, but unbuilt, tube-railway companies taken over in 1901 by Yerkes' consortium: the Great Northern & Strand Railway (GN&SR) and the Brompton & Piccadilly Circus Railway (B&PCR). The GN&SR's and B&PCR's separate routes were linked with an additional section between Piccadilly Circus and Holborn. 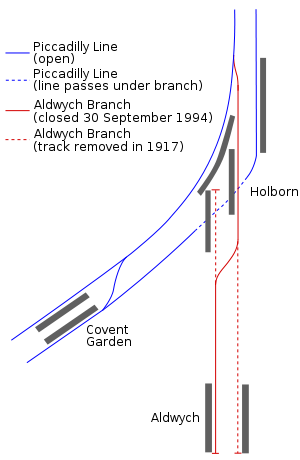 A section of the District Railway's scheme for a deep-level tube line between South Kensington and Earl's Court was also added in order to complete the route. When the GNP&BR was formally opened on 15 December 1906, the line ran from the Great Northern Railway's station at Finsbury Park to the District Railway's station at Hammersmith. On 30 November 1907, the short branch from Holborn to the Strand (later renamed Aldwych) opened; it had been planned as the last section of the GN&SR before the amalgamation with the B&PCR. In 1905 (and again in 1965), plans were made to extend it the short distance south under the River Thames to Waterloo, but this never happened. Although built with twin tunnels, single-track shuttle operation became the norm on the branch from 1918 on, with the eastern tunnel closed to traffic. On 1 July 1910, the GNP&BR and the other UERL-owned tube railways (the Baker Street and Waterloo Railway, the Charing Cross, Euston and Hampstead Railway) were merged by private Act of Parliament to become the London Electric Railway Company. On 10 December 1928, a rebuilt Piccadilly Circus station was opened. This included a sub-surface booking hall and eleven escalators, replacing the original lifts, and was the start of a renovation of the whole railway, including a comprehensive programme of station enlargement. From the 1920s onwards there had been severe congestion at the line's northern terminus, Finsbury Park, where travellers had to change on to trams, buses, or London and North Eastern Railway (LNER) main line trains for destinations in north and northeast London. There had been deputations made to Parliament asking for an early extension of the line either toward Tottenham and Edmonton, or toward Wood Green and Palmers Green. Powers to link with existing tracks west of Hammersmith were obtained in 1913. A Parliamentary report of 1919 recommended through running to Richmond and Ealing. By the end of the 1920s, the priority had shifted to serving the areas around Hounslow and north and west of Ealing. The outcome involved taking over the inner pair of tracks between Hammersmith and Acton Town as a non-stop service, while the Metropolitan District Railway would continue to provide the stopping service on the outer pair of tracks. Construction of the linking sections started in 1930, and the services opened as follows. 13 March 1933: to Hounslow West, in conjunction with the eastern extension to Enfield West. These eastward and westward extensions feature Modernist architecture at their stations, many of them designed by Charles Holden, who was inspired by examples of Modernist architecture in mainland Europe. This influence can be seen in the bold vertical and horizontal forms, which were combined with the use of traditional materials like brick. Many of these Holden-designed station are listed buildings. During the planning stages of the Victoria line, a proposal was put forward to transfer Manor House station to the new line, and also to build new "direct" tunnels from Finsbury Park to Turnpike Lane station, thereby cutting the journey time in and out of central London. This idea was eventually rejected due to the inconvenience to passengers that would have been caused during rebuilding, as well as the costs of the new tunnels. Even so, the Piccadilly line was affected at Finsbury Park by the construction of the Victoria line. The westbound service was redirected through new tunnels, to give cross-platform interchange with the Victoria line on the platforms previously used by the Northern City Line. This work was completed in 1965, and the diversion came into use on 3 October 1965, three years before the opening of the first stage of the Victoria line. In 1975, a new tunnel section was opened to Hatton Cross from Hounslow West. Hounslow West became a tunnel section station. In 1977, the branch was extended to Heathrow Central. This station was renamed Heathrow Terminals 1, 2, 3 in 1984, with the opening of a one-way loop serving Heathrow Terminal 4, south of the central terminal area. To reflect the demolition of Terminal 1 at the end of June 2015, it was renamed again as Heathrow Terminals 2 & 3, although the station signage retains reference to the demolished terminal. From 7 January 2005 until 17 September 2006, the loop via Heathrow Terminal 4 was closed to allow the connection of a spur line to the now operational Heathrow Terminal 5 station. All underground services reverted to two-way working into Terminals 2 & 3, which again became the temporary terminus; shuttle buses served Terminal 4 from the Hatton Cross bus station. For a brief period in summer 2006, the line terminated at Hatton Cross and shuttle buses also ran to Terminals 2 & 3 while the track configuration and tunnels were altered for the Terminal 5 link from that station. The station at Terminal 5 opened on 27 March 2008 on the same day Terminal 5 opened. On 7 July 2005, a Piccadilly line train was attacked by suicide bomber Germaine Lindsay. The blast occurred at 08:50 BST while the train was between King's Cross St. Pancras and Russell Square. It was part of a co-ordinated attack on London's transport network, and was synchronised with three other attacks: two on the Circle line and one on a bus at Tavistock Square. A small high-explosive device, concealed in a rucksack, was used. The Piccadilly line bomb resulted in the largest number of fatalities, with 26 people reported killed. Owing to it being a deep-level line, evacuation of station users and access for the emergency services proved difficult. Parts of the line re-opened on 8 July, and full service was restored on 4 August, four weeks after the bomb. Often late evening services terminate at Oakwood instead of Cockfosters. Trains also make an additional stop at Turnham Green in the early morning and late evening but do not call there during the main part of the day due to capacity constraints with signalling. Other services operate at times, especially at the start and towards the end of the traffic day. Since 16 December 2016, there is a 24-hour Night Tube service on Friday and Saturday nights from Heathrow Terminal 5 to Cockfosters, but not from Uxbridge to Acton Town or the Heathrow Terminal 4 loop. Like most Underground lines, the Piccadilly line is operated by a single type of rolling stock, in this case the 1973 tube stock, in the standard London Underground livery of blue, white and red. Seventy-nine trains out of a fleet of 86 are needed to run the line's peak service. One unit (166-566-366) was severely damaged by the terrorist attack of 7 July 2005. The stock was refurbished by Bombardier Transportation between 1995 and 2000. Changes included the removal of transverse seating, strap hangers replaced with grab bars, new floor material and a full repaint into London Underground's corporate livery. The line was previously worked by 1959 stock, 1956 stock, 1938 stock, standard tube stock and 1906 gate stock. The line has two depots, at Northfieldsmap 55 and Cockfosters.map 54 There are sidings at Oakwood, South Harrow, Arnos Grove, Rayners Lane, Down Street, Wood Green, Acton Town, Ruislip and Uxbridge. In November 2018, Siemens was awarded a £1.5 billion contract to build 94 Inspiro trainsets for the Piccadilly line, with deliveries scheduled to begin in 2023 ahead of entry into service in 2024. The line splits here into two branches – the Heathrow branch and the Uxbridge branch. Just beyond Heathrow Terminals 2 & 3 tube station, the line goes into a new section to serve Heathrow Terminal 5 tube station, which opened in March 2008. Half of all Heathrow trains use the loop and serve Terminal 4 and the other half omit Terminal 4 and serve Terminal 5. Aldwych opened on 30 November 1907 as the Strand tube station. It was at the end of a branch line from the main line at Holborn. An evening through-northbound 'Theatre' train ran until 1910. From 1917 onwards, it was served by a shuttle from Holborn. In the same year it was renamed Aldwych when Charing Cross on the Northern line was renamed Strand. It was temporarily closed in 1940 during World War II to be used as an air-raid shelter. It re-opened in 1946. The possibility of extending the branch to Waterloo was discussed, but the scheme never proceeded. Aldwych was closed on 30 September 1994; the level of use was said to be too low to justify the £1 million in estimated costs of a complete replacement of the lifts. The station is regularly used by film makers. Brompton Road opened 15 December 1906; closed 30 July 1934, between Knightsbridge and South Kensington. Down Street opened 15 December 1906; closed 21 May 1932, between Green Park and Hyde Park Corner. Osterley & Spring Grove first served 13 March 1933; closed 24 March 1934 between Boston Manor and Hounslow East. It was replaced by Osterley. Park Royal & Twyford Abbey opened 23 June 1903; closed 5 July 1931. Although on the route of the current Piccadilly line, a short distance north of the present Park Royal station, it was never served by Piccadilly line trains. It was opened by the District line, the original operator of the line between Ealing Common and South Harrow, and was closed and replaced by the present Park Royal station before the Piccadilly line started running trains to South Harrow in 1932. York Road opened 15 December 1906; closed 19 September 1932, between King's Cross St Pancras and Caledonian Road. It has been suggested that this station may be reopened to serve new developments on the nearby Kings Cross railway lands, but this idea is not being progressed at present. The road the station served, 'York Road', has since been renamed 'York Way'. The Piccadilly line is to be upgraded under the New Tube for London scheme, involving new trains as well as new signalling, increasing the line's capacity by some 24% and reducing journey times by one fifth. Bids for new rolling stock were originally submitted in 2008. However, after the acquisition of Tube Lines by Transport for London in June 2010, this order was cancelled and the upgrade postponed. LUL then invited Alstom, Bombardier and Siemens Mobility to develop a new concept of lightweight, low-energy, semi-articulated train for the deep-level lines, provisionally called "Evo" (for 'evolution'). Siemens publicised an outline design featuring air-conditioning and battery power to enable the train to run on to the next station if third and fourth rail power were lost. It would have a lower floor and 11% higher passenger capacity than the present tube stock. There would be a weight saving of 30 tonnes, and the trains would be 17% more energy-efficient with air-conditioning included, or 30% more energy-efficient without it. Siemens Mobility was awarded a £1.5 billion contract in June 2018 to produce the new trains at a planned factory in Goole, East Yorkshire. The intention is for the new trains to eventually operate on the Bakerloo, Central, Piccadilly and Waterloo & City lines. On current plans, resignalling work on the Piccadilly line will begin in 2019, and new trains are due to enter service in 2023. There are also some proposals, predominantly by Slough Borough Council, to extend the line towards Slough railway station from Heathrow Terminal 5 station. A number of routes have been proposed, and the main ones pass very close to but do not call at Windsor. Also suggested is the Piccadilly to take over District line services to Ealing Broadway, meaning District line trains would divert to the Richmond branch, and the Piccadilly could stop at Turnham Green and Chiswick Park stations. In 2005 a business case was prepared to re-open the disused York Road Underground station, to serve the Kings Cross Central development and help relieve congestion at King's Cross St Pancras. York Road station closed in September 1932 and was about 600 m (660 yd) north of King's Cross St Pancras. ^ "LU Performance Data Almanac". Transport for London. 2011–2012. Archived from the original on 3 August 2012. Retrieved 1 August 2012. ^ The merger was carried out by transferring the assets of the CCE&HR and the BS&WR to the GNP&BR and renaming the GNP&BR as the London Electric Railway. ^ For further detail and references, see the section on the Tube in History of Harringay (1880–present). ^ Barker & Robbins 1974, p. 252. ^ "Underground Journeys: Changing the face of London Underground". Royal Institute of British Architects. Archived from the original on 4 May 2011. Retrieved 19 February 2011. ^ Signalman, Llangollen (6 November 2013). "Earls Court Control Room". Flickr. Retrieved 14 July 2017. ^ Signalman, Llangollen (1 October 2015). "Rayners Lane". Flickr. Retrieved 14 July 2017. ^ "London Underground Working Timetable - Piccadilly line" (PDF). Transport for London. 21 May 2017. Archived (PDF) from the original on 5 December 2018. Retrieved 5 December 2018. ^ "The Night Tube". tfl.gov.uk. Transport for London. Retrieved 14 July 2017. ^ "1973". Transport for London. n.d. Retrieved 20 April 2013. ^ "1973 tube stock". Squarewheels.org.uk. 8 November 2010. Retrieved 20 April 2013. ^ "Siemens signs £1·5bn London Underground train contract". Metro Report International. 20 November 2018. Retrieved 21 November 2018. ^ "Piccadilly line's new timetable". Transport for London. 8 January 2008. Archived from the original on 27 February 2008. ^ "More tube lines discussed: Easing travel load". The Times. London. 27 April 1965. p. 7. ^ "York Way Station". Alwaystouchout.com. 11 January 2006. Retrieved 11 July 2008. ^ "Tube improvement plan: Piccadilly line". Transport for London. Retrieved 29 December 2013. ^ Ford, Roger (October 2010). "Rolling stock famine deepens as Bombardier feasts on past orders". Modern Railways. 67 (745). London. p. 22. ^ Waboso, David (December 2010). "Transforming the tube". Modern Railways. London. p. 44. ^ "Siemens unveils London Underground concept train". Railway Gazette International. London. 20 June 2011. ^ a b "East Yorkshire factory wins £1.5bn Tube train deal". BBC News. 15 June 2018. Retrieved 15 June 2018. ^ "Siemens reveals innovative air-con for deep Tube trains". Rail (673). Peterborough. 29 June 2011. p. 12. ^ "Business Plan 2013" (PDF). Transport for London. December 2013. p. 35. ^ a b "Slough Borough Council presentation" (PDF). Thames Valley Chamber of Commerce Group. Archived from the original (PDF) on 9 August 2013. Retrieved 29 December 2013. ^ "York Road Station Re-opening – Business Case Analysis" (PDF). Halcrow Group Limited. 2005. p. 6. Archived from the original (PDF) on 26 July 2011. The objective would be to ensure that public transport users travelling from the KCC development would benefit from travelling via York Road Station rather than using King’s Cross St Pancras Station. This in turn leads to the subobjective of providing congestion relief for King’s Cross St Pancras Station. ^ Day & Reed 2010, p. 111. Barker, T.C. ; Robbins, Michael (1974). A History of London Transport: Volume two – the Twentieth Century to 1970. London: George Allen & Unwin Ltd. ISBN 0-04-385067-7. Croome, Desmond F. (1998). The Piccadilly Line – An Illustrated History. London: Capital Transport Publishing. ISBN 1-85414-192-9. Horne, Mike (2007). The Piccadilly Tube – A History of the First Hundred Years. London: Capital Transport. ISBN 978-1-85414-305-1. Lee, Charles E. (1966). Sixty Years of the Piccadilly. London: London Transport. Lee, Charles E. (1973). The Piccadilly Line: a brief history. London: London Transport. ISBN 0-85329-042-3. Wikimedia Commons has media related to Piccadilly Line. "Piccadilly line facts". London Underground — Key Facts. Transport for London. Archived from the original on 10 February 2014. Retrieved 12 April 2011. "The Piccadilly Line – History". www.krysstal.com. KryssTal. Retrieved 12 April 2011. "Underground Journeys: Changing the face of London Underground Illustrated history of the Piccadilly line 1920-1930s". www.architecture.com. Royal Institute of British Architects. Archived from the original on 4 May 2011. Retrieved 19 February 2011.